Kip and Dennise Barber's dreams are growing on a hillside in Grass Lake. 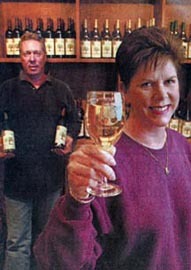 The proprietors of Lone Oak Vineyard Estate opened their new winery March 1, but they've been growing grapes since 1997. It all started because 49-year-old Kip Barber liked wine, began growing grapes in his Ferndale back yard, and after 24 years as a woodworker decided it was time to become a wine maker. He'd experimented with wine making and was surprised by several successful batches. "I hadn't expected them to turn out as well as they did," he recalls. He'd also been dating Dennise Densmore, who introduced him to good wine. Many glasses and much dreaming later, they married. That was 1995. Two years later - after much research, several trips to Napa Valley vineyards and a leap of faith - the couple took out a bank loan, spending $500,000 on 25 rolling acres and 20,000 European grapevines. But the grapes wouldn't yield a full crop for five years. A flight attendant for Northwest Airlines accustomed to a regular paycheck, Dennise was anxious. "It's hard to give up something you've known a long time and delve into something new," she says. She continued flying 12 or 14 days a month, helping Kip on her days off. As for Kip, he knew about risk. He'd started his own woodworking business at 21. "I don't look at roadblocks as vision stifled," he says. "They're problems to be overcome." The couple cleared the land and planted the vines, but one oak tree in the middle of the parcel was simply too precious to give up. "The trunk is so big Kip and I together couldn't get our arms around it," says Dennise. So it stayed, and Lone Oak Vineyard got its name. As the result of research, Kip knew southeastern Michigan and France's Bordeaux region - home of much French wine - share similar soil: sandy, gravelly loam. The two areas also share the same latitude. The difference is weather. Bordeaux's winters are milder, tempered by the Atlantic Ocean. To protect his vines, Barber grows them close to the ground, covering rows with straw in the winter. A south-facing slope also gets more sun than flat ground surrounding it. The Barbers grow seven varieties of grapes, including merlot, chardonnay, pinot noir and zinfandel. But like many other start-ups, vineyards have to wait to see a profit. The Barbers skipped harvesting for three years to strengthen their vines. At the same time, they bought strawberries, blueberries and red raspberries, crushing them for fruit wines. Kip spends much time outdoors, watering, spraying, trimming and trellising his vines. Indoors, he makes wine in a big room adjacent to the wine shop, pouring it into oak barrels lining the walls and eventually into bottles. Work weeks often stretch to 60 or 80 hours. This year will bring Lone Oak's first full grape crop. It's also brought 2,200 estate-grown bottles ready for sale, the product of smaller crops, all aged two to three years. They include a chancellor, a merlot, a seyval blanc, a festiva red and a cabernet sauvignon. Prices range from $6.95 for a vineyard rose (similar to a white zinfandel) to $18.95 for a red raspberry dessert wine.